With Memorial Day in the rear view mirror and the 4th of July just around the corner, it’s time to up your grill game. Because let’s face it, everything tastes better on the grill. If you are planning on having the family over for a Saturday cook-out, or a romantic date night, here are a few tricks of the trade that will be sure to make you cook like Bobby Flay. Halt the salt. Adding salty seasonings to meat before you grill it can take all the moisture out of the meat. So be sure to add the rub after grilling when the meat is resting. Lather up that bird. If you are grilling chicken with the skin on, rubbing some olive oil or butter will ensure the chicken will have a nice crispy skin while keeping all the moisture locked inside. To skewer or not to skewer. 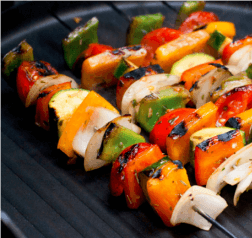 No question, if you are grilling vegetables, try using skewers or a grill basket if you are going to fire up small veggies like cherry tomatoes or mushrooms. It will keep your culinary masterpiece from falling between the grates. And last but not least, make sure you always keep your grill clean after every use. This way all of your food will taste great this summer season. Bon Appetit!